Another early photograph at the artist at work. 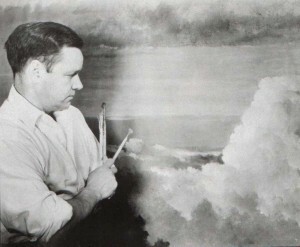 Here Eric Sloane is examining a finished “cloudscape”, a term he claimed to coin for his paintings of just the sky with perhaps a plane flying through the cloud formations. From the photographers perspective, this cloudscape appears quite large, though not uncommon for the period.